Daily hydration and nourishment for the skin thanks to natural oils. 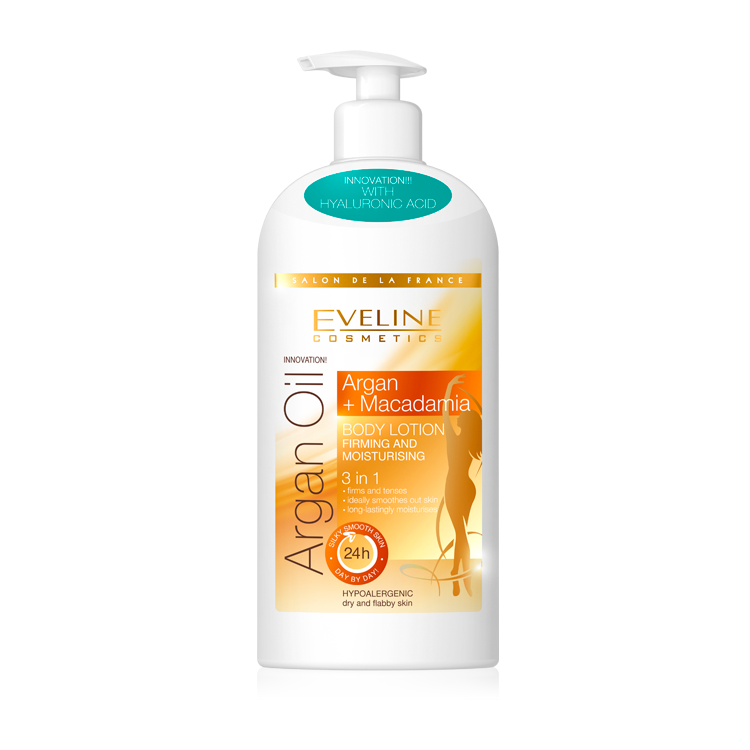 Argan Oil Body Lotion based on natural oils intensively moisturises and nourish the skin at the same time giving it silky smoothness and exceptional firmness. Argan oil perfectly improves firmness and skin resilience as well as intensely nourishes and regenerates. High content of vitamins and microelements precious for the skin makes the skin regain its beautiful look, elasticity and silky smoothness. Macadamia oil has intensely firming properties, giving skin the push-up effect, activates cells growth, stimulates microcirculation, facilitates removal of toxins located in subcutaneous tissue. Hyaluronic acid long-lastingly moisturises skin and restores its elasticity and proper tension. It fills in skin unevenness from the inside, ensuring perfect lifting and shaping effect.